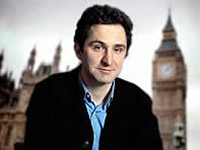 Jonathan Stroud was born in Bedford, England and grew up in St. Albans, near London. After graduating from university with a degree in English, Stroud worked for several years as an editor at Walker Books. His first book, Buried Fire, was published in 1999. 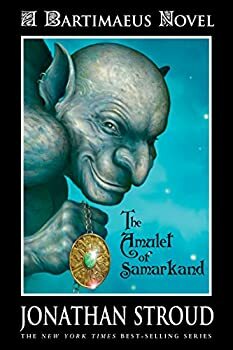 THE BARTIMAEUS TRILOGY won the 2006 Mythopoeic Society Award for Children’s literature, and the first book in the series, The Amulet of Samarkand, won the Boston Globe/ Horn Book award in the US in 2004. Learn more about Stroud at his website. Bartimaeus — (2003-2011) Ages 9-12. Publisher: A witty, gripping adventure story featuring a boy and his not-so-tame djinni. Nathaniel is a young magician’s apprentice, taking his first lessons in the arts of magic. But when a devious hotshot wizard named Simon Lovelace ruthlessly humiliates Nathaniel in front of everyone he knows, Nathaniel decides to kick up his education a few notches and show Lovelace who’s boss. With revenge on his mind, he masters one of the toughest spells of all: summoning the all-powerful djinni, Bartimaeus. But summoning Bartimaeus and controlling him are two different things entirely, and when Nathaniel sends the djinni out to steal the powerful Amulet of Samarkand, Nathaniel finds himself caught up in a whirlwind of magical espionage, murder, blackmail, and revolt. Set in a modern-day London spiced with magicians and mayhem, this extraordinary, funny, pitch-perfect thriller will dazzle the myriad fans of Artemis Fowl and the His Dark Materials trilogy. And with the rights sold in more than a dozen countries, and a major motion picture in the works, the Bartimaeus trilogy is on the fast track to becoming a classic. As I've said in previous reviews, if you're going to set your book in England and have as a main character a young boy learning the art of wizardry, you've guaranteed yourself a comparison to HARRY POTTER. With The Amulet of Samarkand, Jonathan Stroud can proudly say, "bring him on — wands at 15 paces!” With so much pallid fantasy out there, Amulet is a breath of fresh air, told in a witty, original voice within a well-constructed plot and structure focused on two complex characters. 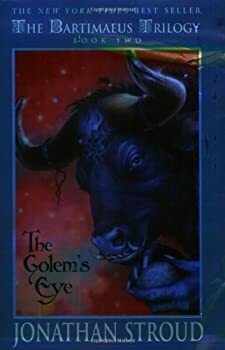 The Golem's Eye is a solidly enjoyable if slightly disappointing follow-up to The Amulet of Samarkand, which admittedly set itself a very high standard. The book returns to the same setting and characters first introduced in Samarkand, while expanding upon the first novel with a few new characters, one new setting (Prague) and a somewhat more complicated plot. As in the first book, the major story involves a plot against the government which Nathaniel the young ambitious wizard must confront with his much more wise and experienced (and acidic) djinn, Bartimeus. Suspects are the Prague Council, a traitor within the British govt., someone bent on personal revenge, and the Resistance, including young Kitty from book one. The Ring of Solomon: Bartimaeus is back! 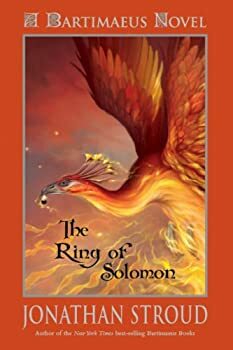 Fans of Jonathan Stroud’s fantastic Bartimaeus Trilogy, which began with The Amulet of Samarkand and ended with Ptolemy’s Gate, will be happy to know that the title character — the wise-cracking fourth-level djinn who has long-standing issues with authority — is back and funny as ever in The Ring of Solomon. Lockwood & Co. — (2013-2017) Publisher: A sinister Problem has occurred in London: all nature of ghosts, haunts, spirits, and specters are appearing throughout the city, and they aren’t exactly friendly. Only young people have the psychic abilities required to see — and eradicate — these supernatural foes. Many different Psychic Detection Agencies have cropped up to handle the dangerous work, and they are in fierce competition for business. In The Screaming Staircase, the plucky and talented Lucy Carlyle teams up with Anthony Lockwood, the charismatic leader of Lockwood & Co, a small agency that runs independent of any adult supervision. After an assignment leads to both a grisly discovery and a disastrous end, Lucy, Anthony, and their sarcastic colleague, George, are forced to take part in the perilous investigation of Combe Carey Hall, one of the most haunted houses in England. Will Lockwood & Co. survive the Hall’s legendary Screaming Staircase and Red Room to see another day? 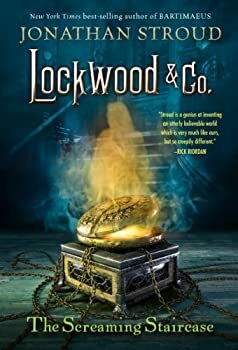 Readers who enjoyed the action, suspense, and humor in Jonathan Stroud’s internationally best-selling Bartimaeus books will be delighted to find the same ingredients, combined with deliciously creepy scares, in his thrilling and chilling Lockwood & Co. series. LOCKWOOD & CO. is Jonathan Stroud’s second four-part outing. It follows on from the success of his BARTIMAEUS sequence (which comes highly recommended here at FanLit). Stroud specialises in alternate versions of London for children. In BARTIMAEUS it was a London of djinn-conjuring wizards. This time London is troubled by deadly ghosts. The Screaming Staircase is a pacey, exciting introduction to Stroud's new London, but it lacks the sense of magic and humour that made BARTIMAEUS such a winner. 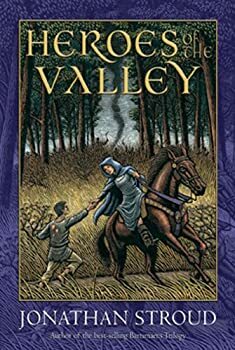 In the long ago history of Jonathan Stroud’s YA fantasy Heroes of the Valley, the great hero Svein gathered the other 11 heroes of the Valley to fight the Battle of the Rock against the ravening inhuman Trows who had long terrorized the Valley residents, snatching babies and killing women and children at night — the only time the Trow came out. At the end of the battle, the heroes were all dead but the Trow were driven utterly out of the valley and into the heights. Since then, the Twelve Houses of the Heroes have buried their dead in cairns lining the boundary of the Valley, each body holding a sword to keep the Trow out while none of the Valley residents go past the cairns. Also, the houses have given up violence, instead solving problem through arbitration, and the leaders of each house are Arbiters, their wives the Lawgivers. The Leap — (2001) Publisher: No one believes Charlie when she tells them what happened to Max at the Mill Pool. They all think she’s in shock; even her brother James can’t begin to understand. So as she recovers in the hospital bed, Charlie vows to hunt for Max alone. The Last Siege — (2003) Publisher: A chance encounter on the snowy slopes of a castle moat throws together three lonely teenagers: Emily, Simon, and the highly enigmatic Marcus, who is the catalyst for all that follows. At first the castle’s ruins are merely the backdrop to a day in the snow. But when the three break into the forbidden interior of the keep, they find the castle taking on a different and deeper meaning. Despite the freezing conditions, they spend the night there, to experience the power of occupation. But when the re-enactment gets out of control and a very real siege ensues, their playful dare soon turns into a frenzy of nightmarish action. The Ghost of Shadow Vale — (2009) Publisher: Thorhall is grateful when he hears the ferocious Glam is willing to be his shepherd. But when a fight with a monster leaves Glam dead, his ghost begins to haunt Shadow Vale. Who will be brave enough to confront the wicked spectre? The hero Grettir thinks he may be in with a chance. Will he manage to defeat Glam? CLICK HERE FOR MORE BOOKS BY JONATHAN STROUD.